Ripping a still-beating heart from the chest cavity that shelters it, as the blood washes all over you in a warm, red fountain. It runs in rivulets, like miniature water falls, down your face; some even winds its way toward your open mouth. The penny-copper tastes coats your tongue before making its way down your throat. At first you double over, gaging for a moment before feelings of revulsion are soon replaced by a sated feeling that–before now–you’ve been entirely unacquainted with. If reading about such terrors is your idea of entertainment–it’s definitely mine–then The Gallery of Horrors Bundle is for you. The books are offered by StoryBundle, and contains six books by writers such as Martin Kee, Brent J. Tally, and Tanya Eby. Now here’s the cool part. If you pay more than $12 for the Bundle, you get three bonus books: Irregular Creatures by Chuck Wendig, I, Zombie by Hugh Howie and The Red Church by Scott Nicholson. I can’t speak for everyone, but the scariest thing that I can think of would be to let such an awesome bundle of eBooks (readable in iBooks–my preference–or Kindle, Kobo or any other reader that accepts .epub or .mobi files) go away. Posted in Books, genre, horror, My Two Cents, writers.Tagged Brent J. 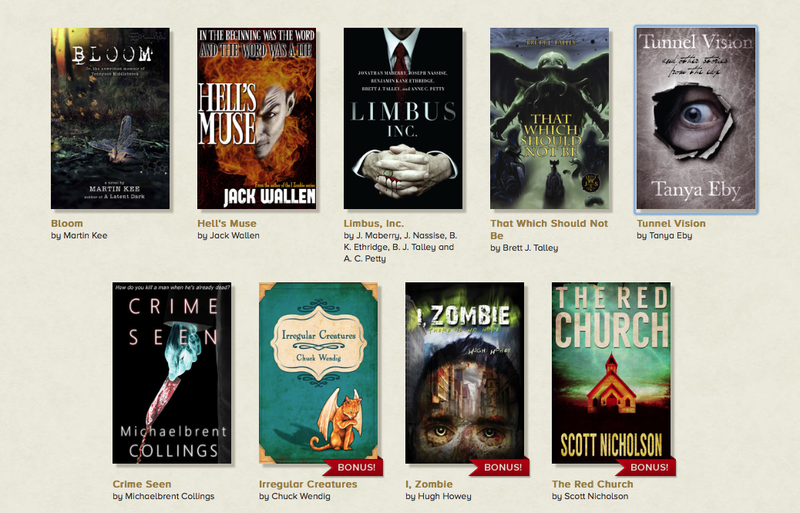 Tally, Chuck Wendig, Hugh Howie, Irregular Creatures, I_Zombie, Martin Kee, Scott Nicholson, Tanya Eby, The Red Church.